The 2017 Blancpain GT Series Endurance Cup was the seventh season of the Blancpain GT Series Endurance Cup. The season began on 23 April at Monza and ended on 1 October in Barcelona. The season featured five rounds, with each race lasting for a duration of three hours besides the 24 Hours of Spa and the 1000 km Paul Ricard events. At the annual press conference during the 2016 24 Hours of Spa on 29 July, the Stéphane Ratel Organisation announced the first draft of the 2017 calendar. The Sprint Cup round in Barcelona became an Endurance Cup round, replacing the round at the Nürburgring. Championship points were awarded for the first ten positions in each race. The pole-sitter also received one point and entries were required to complete 75% of the winning car's race distance in order to be classified and earn points. Individual drivers were required to participate for a minimum of 25 minutes in order to earn championship points in any race. Points were awarded after six hours, after twelve hours and at the finish. ^ a b c Car No. 1 entered as Audi Sport Team WRT. Car No. 2 entered as Belgian Audi Club Team WRT at Rounds 1, 2 and 5, but entered as Audi Sport Team WRT at Rounds 3 and 4. Car No. 5 entered as Belgian Audi Club Team WRT at Rounds 1 to 3 and 5, but entered as Audi Sport Team WRT at Round 4. Car No. 6 entered as Belgian Audi Club Team WRT at Round 3, but entered as Team WRT at Round 4. Cars No. 3 and 17 entered as Team WRT. ^ a b Car No. 4 entered as Mercedes-AMG Team Black Falcon at Rounds 1 to 3 and 5, but entered as Black Falcon at Round 4. Cars No. 15, 16 and 18 entered as Black Falcon. ^ a b Car No. 22 entered as Motul Team RJN Motorsport and car No. 23 entered as Motul Team RJN Nissan. ^ a b Car No. 25 entered as Audi Sport Team Saintéloc and its drivers scored points for Saintéloc Racing at Round 3 and for Audi Sport Team Saintéloc at Round 4. Car No. 26 entered as Saintéloc Racing. ^ a b c d e Car No. 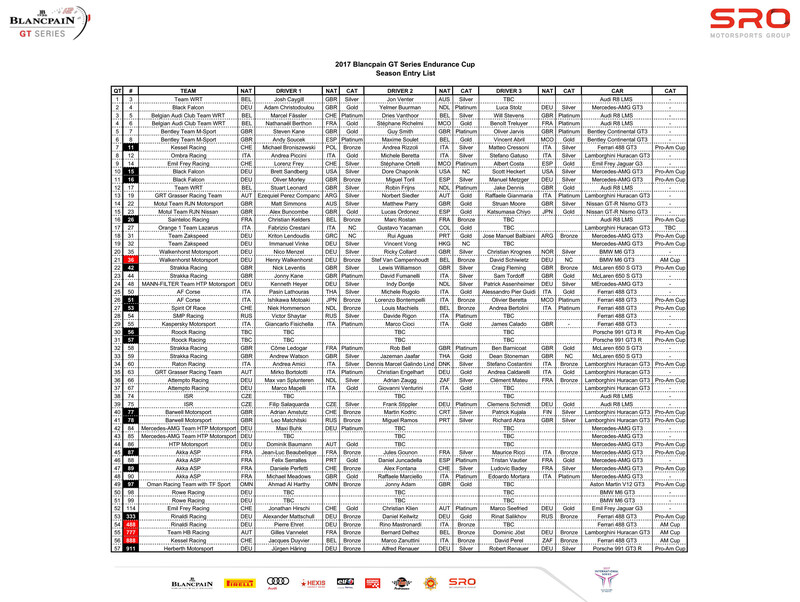 37 entered as BBT under Chinese licence and its drivers scored points for BBT instead of AF Corse. Car No. 50 entered as Spirit of Race under Swiss licence, but its drivers scored points for AF Corse. Cars No. 51, 52 and the Am entry of 961 entered as AF Corse and car No. 55 entered as Kaspersky Motorsport, both under Italian licence. Cars No. 53 and the Pro-Am entry of 961 entered as Spirit of Race under Swiss licence and its drivers scored points for Spirit of Race instead of AF Corse. Car No. 72 entered as SMP Racing under Russian licence and its drivers scored points for SMP Racing instead of AF Corse. ^ a b Car No. 42 entered as Strakka Racing at Round 1 and from Round 3 on, but as Strakka Motorsport at Round 2. Cars No. 43, 44, 58 and 59 entered as Strakka Racing. ^ a b c Car No. 48 entered as MANN-FILTER Team HTP Motorsport, car No. 84 as Mercedes-AMG Team HTP Motorsport and cars No. 85 and 86 entered as HTP Motorsport. ^ a b Car No. 75 entered as ISR. Car No. 76 entered as Audi Sport Team ISR and its drivers scored points for ISR at Round 3 and for Audi Sport Team ISR at Round 4. ^ a b Cars No. 87, 89 and 90 entered as AKKA ASP. Car No. 88 entered as AKKA ASP at Rounds 1 to 3 and 5, but entered as Mercedes-AMG Team AKKA ASP at Round 4. ^ "2017 Blancpain GT Series Calendar" (PDF). blancpain-gt-series.com. SRO Motorsports Group. 29 July 2016. Retrieved 30 August 2016. ^ a b c d e Wouters, Vincent (2 April 2017). "Goodsmile Racing Enters 24H Spa With Kobayashi". sportscar365. John Dagys Media. Retrieved 21 June 2017. ^ a b c d Wouters, Vincent (27 February 2017). "WRT Confirms Blancpain GT Entries". sportscar365. John Dagys Media. Retrieved 27 February 2017. ^ a b c d e f g h i j k l m n Kilshaw, Jake (15 June 2017). "WRT, Sainteloc, ISR to Run Factory-Backed Audis at 24H Spa". sportscar365. John Dagys Media. Retrieved 21 June 2017. ^ a b c d e f g h i j k l Wouters, Vincent (9 March 2017). "WRT Reveals Blancpain GT Driver Lineups". sportscar365. John Dagys Media. Retrieved 9 March 2017. ^ a b c d e f g h i j k l m n o p q r s t u v w x y z aa "Blancpain GT Series Endurance Cup Circuit Paul Ricard 1000kms Entry List". blancpain-gt-series.com. SRO Motorsports Group. 20 June 2017. Retrieved 24 June 2017. ^ a b c d e f g h i j k l m n o p q r "Spa 24 Entry Reduced To 64 Cars". dailysportscar.com. Dailysportscar. 21 July 2017. Retrieved 21 July 2017. ^ a b c d e f g h i j k l m n o p q r s t u v w x y z aa ab ac ad ae af ag ah ai aj "2017 Blancpain GT Series Endurance Cup - TOTAL 24 HOURS OF SPA Entry List" (PDF). blancpain-gt-series.com. SRO Motorsports Group. 4 July 2017. Retrieved 4 July 2017. ^ "Team WRT to Barcelona to chase the Blancpain GT Series Teams' title". motorsport.com. Motorsport.com. 28 September 2017. Retrieved 28 September 2017. ^ Kilshaw, Jake (24 July 2017). "Lotterer to Make Audi Return with WRT at 24H Spa". sportscar365. John Dagys Media. Retrieved 24 July 2017. ^ Kilshaw, Jake (20 April 2017). "Frijns Injured, Replaced by Winkelhock for Monza". sportscar365. John Dagys Media. Retrieved 20 April 2017. ^ a b c d e f g h "Blancpain GT Series Endurance Cup Silverstone Entry List". blancpain-gt-series.com. SRO Motorsports Group. 13 May 2017. Retrieved 17 May 2017. ^ a b c d e f g h i j k l m n o p q r s t u v w x y z aa ab ac ad ae af ag ah ai aj ak al am an ao ap aq ar as at au av aw ax ay az ba bb bc bd be bf bg bh bi bj bk bl bm bn bo bp bq br bs bt bu bv bw bx by bz ca cb cc cd ce "2017 Blancpain GT Series Endurance Cup Season Entry List". blancpain-gt-series.com. SRO Motorsports Group. 13 March 2017. Retrieved 13 March 2017. ^ a b c d e f g h Kilshaw, Jake (10 January 2017). "Jarvis Joins Bentley in GT3 Switch". sportscar365. John Dagys Media. Retrieved 26 January 2017. ^ a b c d e Kilshaw, Jake (28 June 2017). "Bentley Confirms Additional Car for 24H Spa". sportscar365. John Dagys Media. Retrieved 28 June 2017. ^ a b "Ombra Racing enters Huracan in Blancpain GT Series Endurance Cup". blancpain-gt-series.com. 3 February 2017. Retrieved 3 February 2017. ^ a b c "Full Pro line-up for Ombra Racing in Blancpain GT Series Endurance Cup". blancpain-gt-series.com. 10 February 2017. Retrieved 10 February 2017. ^ a b Kilshaw, Jake (24 January 2017). "Two Emil Frey Jaguars Confirmed for Blancpain GT Endurance Cup". sportscar365. John Dagys Media. Retrieved 24 January 2017. ^ a b "Emil Frey Jaguar Racing charged-up for Blancpain GT Series season final". jaguar.emilfreyracing.com. Emil FreyRacing. 21 September 2017. Retrieved 28 September 2017. ^ a b Simons, Arne (27 September 2017). "Barcelona: Vervisch versterkt Grasser Racing op derde wagen". autosport.be. Autosport.be. Retrieved 28 September 2017. ^ a b c d e f g h i j k l m n o p q "Blancpain GT Series Endurance Cup Barcelona Entry List". blancpain-gt-series.com. SRO Motorsports Group. Retrieved 28 September 2017. ^ a b c d e f Dagys, John (17 February 2017). "Team RJN Nissan Scales Back Blancpain GT Program". sportscar365. John Dagys Media. Retrieved 17 February 2017. ^ a b c Dagys, John (5 March 2017). "Nissan Confirms Second RJN Entry for Endurance Cup". sportscar365. John Dagys Media. Retrieved 5 March 2017. ^ a b c d e Kilshaw, Jake (17 May 2017). "Reiter Young Stars Lamborghini Moves to Endurance Cup with Enge". sportscar365. John Dagys Media. Retrieved 17 May 2017. ^ a b c d e f g h i j k l m n o p q "Blancpain GT Series Endurance Cup Monza Entry List". blancpain-gt-series.com. SRO Motorsports Group. 14 April 2017. Retrieved 14 April 2017. ^ a b c d e "Blancpain GT Series Endurance Cup Total 24 Hours of Spa Entry List". blancpain-gt-series.com. SRO Motorsports Group. 26 July 2017. Retrieved 27 July 2017. ^ a b c d e f Dagys, John (9 March 2017). "Zakspeed Set for Expanded Endurance Cup Effort". sportscar365. John Dagys Media. Retrieved 9 March 2017. ^ a b c d Wouters, Vincent (28 February 2017). "Walkenhorst, HB Racing Join Blancpain GT Endurance Grid". sportscar365. John Dagys Media. Retrieved 28 February 2017. ^ Gruz, David (23 March 2017). "BMW signs ex-F3 driver Jensen to junior scheme". motorsport.com. Motorsport.com. Retrieved 23 March 2017. ^ a b c d Wouters, Vincent (3 March 2017). "Lathouras Confirms Pro Cup Return With AF Corse". sportscar365. John Dagys Media. Retrieved 3 March 2017. ^ a b c d Wouters, Vincent (11 November 2016). "Kaspersky Confirms Fisichella, Cioci in Pro Cup Ferrari". sportscar365. John Dagys Media. Retrieved 11 November 2016. ^ "Rory Butcher Joins Spirit of Race Effort For Silverstone & Spa 24 Hours". dailysportscar.com. Dailysportscar. 29 April 2017. Retrieved 29 April 2017. ^ Kilshaw, Jake (9 February 2017). "Calado Joins Fisichella, Cioci in Kaspersky Ferrari". sportscar365. John Dagys Media. Retrieved 10 February 2017. ^ Khorounzhiy, Valentin (15 March 2017). "Audi DTM refugee Molina gets SMP Ferrari seat in Blancpain". Motorsport.com. Retrieved 15 March 2017. ^ a b c Dagys, John (8 November 2016). "Strakka Confirms Switch to Blancpain GT With Four-Car McLaren Effort". sportscar365. John Dagys Media. Retrieved 8 November 2016. ^ a b c d e f g h i j k l m Khorounzhiy, Valentin (13 March 2017). "Stoneman, Tordoff headline Strakka's Blancpain line-up". Motorsport.com. Retrieved 13 March 2017. ^ a b "Strakka Adds Webb To Lineup For Silverstone & Spa 24". dailysportscar.com. Dailysportscar. 2 May 2017. Retrieved 2 May 2017. ^ Kilshaw, Jake (21 July 2017). "Schothorst Replaces Stoneman at Strakka for 24H Spa". sportscar365. John Dagys Media. Retrieved 21 July 2017. ^ "Steijn Schothorst Joins Strakka Racing". dailysportscar.com. Dailysportscar. 8 September 2017. Retrieved 8 September 2017. ^ a b c d Wouters, Vincent (10 March 2017). "HTP Confirms First Endurance Cup Lineup". sportscar365. John Dagys Media. Retrieved 10 March 2017. ^ a b c Dagys, John (11 November 2016). "Buhk to Return to Mercedes-AMG, HTP in Title Defense". sportscar365. John Dagys Media. Retrieved 11 November 2016. ^ Khorounzhiy, Valentin (19 April 2017). "Filippi to make Blancpain debut at Monza". Motorsport.com. Retrieved 19 April 2017. ^ Kilshaw, Jake (10 June 2017). "Albuquerque Joins ISR for 24H Spa". sportscar365. John Dagys Media. Retrieved 10 June 2017. ^ a b c d e f g h Kilshaw, Jake (6 February 2017). "Barwell Confirms Drivers for Blancpain GT Endurance Cup". sportscar365. John Dagys Media. Retrieved 6 February 2017. ^ a b Kilshaw, Jake (27 September 2017). "Bleekemolen, Abbott Join Barwell for Barcelona". sportscar365. John Dagys Media. Retrieved 28 September 2017. ^ a b c d e f g h i j k l m Wouters, Vincent (1 March 2017). "AKKA-ASP Expands to Four-Car Mercedes-AMG GT3 Effort". sportscar365. John Dagys Media. Retrieved 1 March 2017. ^ a b c d Wouters, Vincent (15 February 2017). "TF Sport Takes Over Oman Racing Blancpain GT Entry". sportscar365. John Dagys Media. Retrieved 15 February 2017. ^ a b Kilshaw, Jake (14 February 2017). "ROWE Continues With Two-Car BMW Entry in Blancpain GT". sportscar365. John Dagys Media. Retrieved 14 February 2017. ^ a b c d e Kilshaw, Jake (9 May 2017). "Spengler, Klingmann Join ROWE for Silverstone". sportscar365. John Dagys Media. Retrieved 9 May 2017. ^ a b c d e f g h i j Kilshaw, Jake (30 June 2017). "Team75 Bernhard Confirms 24H Spa Pro Cup Entry". sportscar365. John Dagys Media. Retrieved 30 June 2017. ^ a b c d e "Garage 59 Returns To Blancpain For Silverstone & Spa 24 Hours". dailysportscar.com. Dailysportscar. 8 May 2017. Retrieved 8 May 2017.